The army was deployed in Darjeeling yesterday after Gorkha Janmukti Morcha supporters clashed with the police while Chief Minister Mamata Banerjee was holding a cabinet meeting. 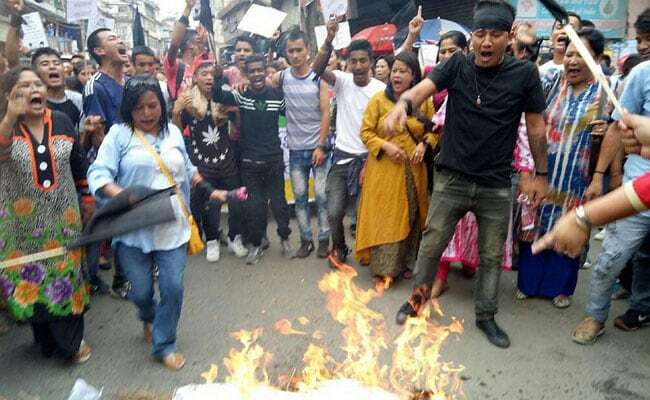 Darjeeling: Gorkha Janmukti Morcha chief Bimal Gurung today projected himself as the "chief minister of the hills" and challenged West Bengal Chief Minister Mamata Banerjee to stop the agitation in the area. The GJM leader said it was his writ that "ran in the hills." "As the chief minister of West Bengal she is trying to show her strength. But she must not forget that I am an elected member of the Gorkhaland Territorial Administration. I am the chief minister of the hills. I challenge her to stop the agitation in the hills," Mr Gurung said. Mr Gurung said he will directly talk to the central government on army deployment and alleged police atrocities in the hills. "I will talk to the centre. We are an ally of NDA (National Democratic Alliance). We will give them all the details of police atrocities on innocent people of the hills," he said. Two columns of the army were deployed in Darjeeling yesterday after GJM supporters clashed with the police, damaged police vehicles and torched some of them. Ms Banerjee was holding a cabinet meeting there. The police fired tear gas to disperse the protesters who tried to march to the venue of the state cabinet meeting yesterday.